You can never have too many cupcake recipes. 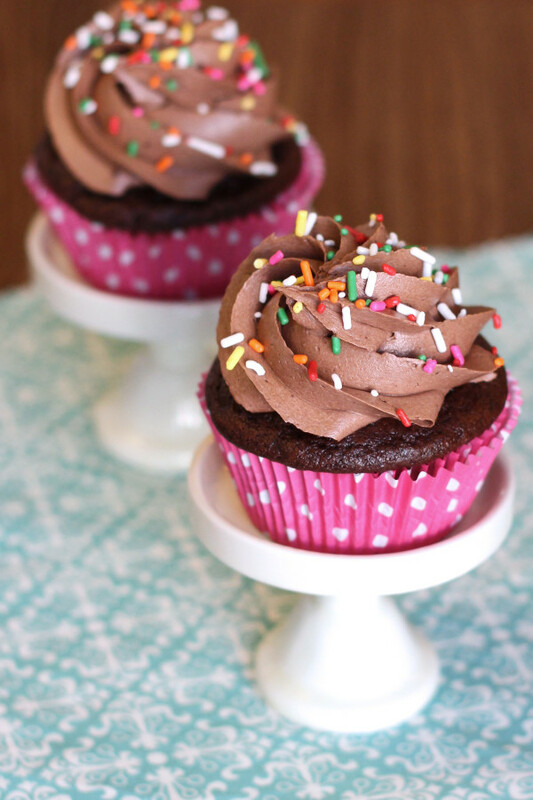 A good, basic vanilla cupcake recipe and a chocolatey, chocolate one are both a must. I’m sharing my most favorite chocolate cupcake with chocolate buttercream recipe today. 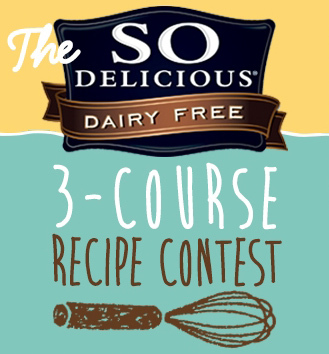 It’s also my third and final recipe entered into the Go Dairy Free and So Delicious recipe contest. I’m hoping this will be the winner! I mean, who doesn’t like a moist, delicious cupcake? And it’s a CHOCOLATE cupcake too! 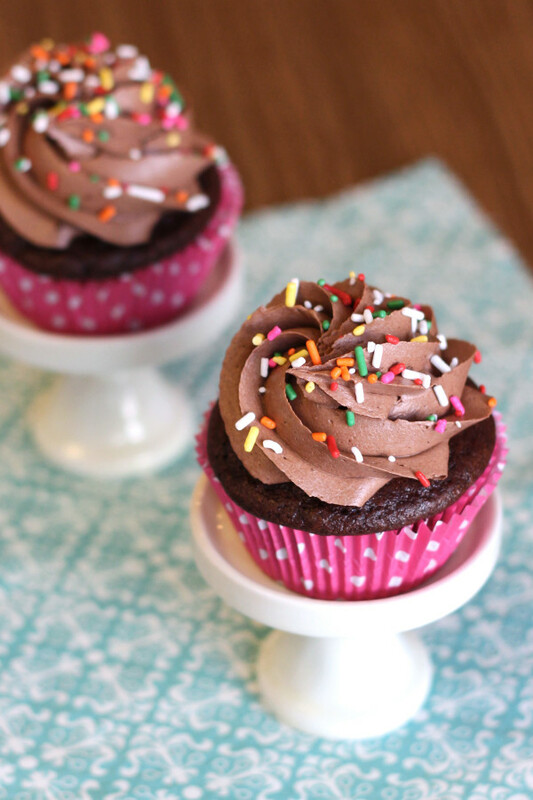 This is the best gluten, dairy, egg free chocolate cupcake recipe around. Stop searching. This is it. I’ve made this chocolate cake batter more times than I can count. You would think my family would be sick of it by now (no way). It’s beyond decadent, has a tender crumb and the buttercream….oh the chocolate buttercream. Light, fluffy and good enough to eat by the spoonful. For your next birthday, celebration or when you just want to bite into an crazy-good cupcake, these will surely do! In large mixing bowl, stir together coconut milk, water and vinegar. Allow to sit for 1 minute to curdle. Add sugar, oil, and vanilla extract. Slowly whisk in the flour mixture. Beat for 1 minute. To make buttercream, beat together vegan butter with shortening for 1 minute in large bowl of standing mixer. Add powdered sugar, cocoa powder, coffee creamer and vanilla. Beat for an additional 2 minutes. Add 1-2 tablespoons coffee creamer to buttercream, if needed. Continue to beat until light and fluffy. Place in piping bag with large star tip and frost cooled cupcakes. sarah – I love your recipes and flour blend!!!! Keep up the fabulous work!!! yes, wooops 🙂 1/2 cup. fixed! These are gorgeous! Yum, can't wait to try them! Sarah, thanks for all your recipes, you have really helped our family! I forgot to say these were fabulous! Made them for breakfast with a few enjoy life chips on top and no frosting. My little brother is having a birthday party at the beach (we live in hawaii and it's super hot) so I was wondering if the frosting melts in the sun? I want to try to make the cupcakes for him. They look super bomb. Keep them in the fridge until ready to take them to the beach. Then keep them in the shade. The frosting will get soft so keep them as cool as possible! You can also keep them in a cooler until the party starts. Is this also a nut free recipe? Making it for my nephews birthday and just wanted to make sure! It seems like it? No nuts in this recipe so you're good to go! Could I make this with regular flour, not gluten free? thanks for your recipe it was divine!!! Could you tell me which brand of cocoa you used? I usually use Trader Joe's cocoa powder, but any cocoa powder will work just fine! Could I make this with a different gluten free flour blend? I have a bag of Bob's Red Mill GF flour on hand already. 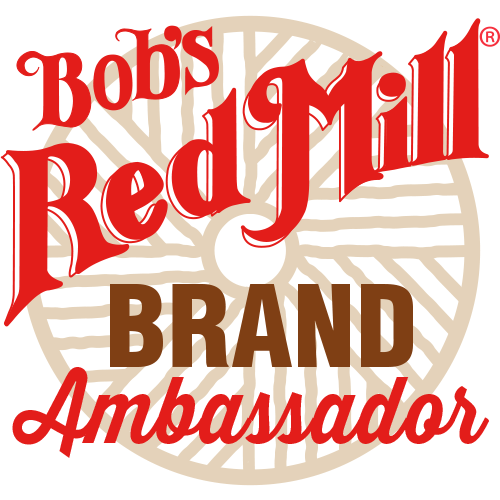 Bob's Red Mill should work fine, but if it doesn't have the xanthan gum, you need to be sure to add some. 1 teaspoon is what you'll need for this recipe. What can be substituted for the creamer? You can use regular, in the carton, coconut milk (unsweetened or sweetened). Sarah, this is an amazing recipe! I will be making these often. I will also make a cake mix out of this recipe so I can make them in a few minutes. My boys who are gluten and egg intolerant second guessed me when I said they could have these cupcakes, and my brother-in-law who scoffs at gluten free baking ate them and didn't know he was eating "healthy" food:) Thanks a million!!!! Thanks, Rachel! I'm so glad you and your family are enjoy my recipes! These muffins are awesome ! I did make a few substitutions, for my husband who has Crohn's, Celiac Disease, and can only have small amounts of sugar, (also no dairy, but this recipe has none, yay!) It's always a challenge making some recipes work. I used Rice milk, in place of the coconut milk, and olive oil in place of the coconut oil, (too much coconut upsets his digestive system), and used erythritol and xylitol for a sugar substitute. Didn't make the frosting, but these cupcakes are so moist, you really don't need any. I'll be making these often, it's a keeper ! Thanks, and looking forward to trying more of your recipes. Debbie W.
Did you use the Earth balance baking sticks or the kind in the tub? These turned out great for me! Whole family loved them. Thank you! Do you think this could be cooked in a round cake pan? Idea on bake time? Or would the centers not cook? Yes, you can bake this recipe in a 9-inch cake pan. Bake for 25-27 minutes, or until toothpick inserted in center comes out clean. Enjoy! Thanks for this recipe. I just made it and they taste great. But…this frosting was so soupy I added about another cup of powdered sugar trying to get it fluffy and stiff to no avail. I didn't add the cocoa powder so I expected to have to add some more sugar to make up for that but I think I could have added another 2 cups and still not gotten anywhere. I ever chilled it in the fridge and it's still like soup. I've run into similar problems whenever I bake anything vegan: If I make brownies from scratch, or a veganized version of boxed brownies, they turn into a bubbling oily mass of goop. I've tried various egg substitutes (flax, vegg, applesauce) and tried adding 1/2 tsp baking soda to boxed mixes, but they all come out the same. I'm so frustrated because this is probably my 6th failed recipe and clearly it's not the recipe's fault. I'm hoping you might have some suggestions. Thanks for any help! Cat, I'm so sorry you were having difficulties with the frosting! I would try to just add 2 tablespoons of the creamer or milk, and go from there. Sometimes when I buy the Spectrum Organic shortening, it's a bit oily. Let me know if adding a bit less milk helps! I was wondering if you've ever frozen these? I haven't but I'm sure it would work perfectly! Just freeze them plain, then frost when defrosted. These are amazing! And they froze beautifully – thanks again! Thank you! These are my favorite too 🙂 I'm actually making a batch right now, to top with a mint chocolate chip buttercream. They'll be on the blog later this week! Thank you so much for developing this delicious recipe. I have a son with autism, and he is on a very strict elimination diet right now. I was so worried about his brother's birthday, because I didn't know what kind of treat to make for them that would fit in with his diet and still taste delicious. I made these cupcakes exactly according to directions and they were SO DELICIOUS. Our whole family enjoyed them, and also said that if they hadn't known they were allergen free, they wouldn't have even noticed a difference! So thanks for helping make my son's birthday fun and delicious. Thank you for sharing, Nikole! I'm so glad your family enjoyed these cupcakes. They are our favorite as well! This cupcake recipe is delicious. I made them for my daughter's baby shower (she is dairy free, gluten free, soy free, and egg free). I also made "regular" cupcakes. Upon comparison of the two, these were the best! I've used the recipe a number of times now and they always turn out wonderful. My daughter is the one who directed me to your website and I am sooo glad. I use your recipes when I make dessert for her and I've never been disappointed. Judy, I'm so glad you are enjoying my recipes! These cupcakes are my go-to cupcakes too 🙂 Thank you for sharing and for your sweet comments! My daughter wants a chocolate cake for her birthday. To make a 2-layer cake, should I just double the recipe? We made these chocolate cupcakes for my sons birthday last weekend and they were the best chocolate cupcakes I have ever had! Everyone loved them allergy free and all!! these are my daughter’s favorite cupcakes..thanks for an awesome recipe! You seriously need to write a cookbook Sarah! I have been a big fan for a lot of years. I would love to have a cookbook on hand with all my faves, like funfetti cupcakes, orange cupcakes, and I always come to your site when I need a good frosting recipe. Thanks for being in my life, and Happy New Year!!! You are so sweet, Megan!